Every practice is different, every location is different, and every dental procedure you advertise for is different. Which makes deciding the what, and when to use media a complicated logic puzzle to be solved with unbiased, up-to-date research. To make your investment even more economically efficient, creating the correct content for the media is both an art and a science. RAMP offers a depth of unbiased research based on the combination of your business data and media data only available to the largest of advertising companies. The result of this thorough review of your market yields RAMP’s recommendations on where to spend your marketing dollars for what is best for you. Not what’s best for the media outlet. The following list of media examples and content are just a glimpse into the art and science of the seventeen years of RAMP’s time-tested formulas. Television brings the power of imagery to advertising. RAMP will look at all your options: regional cable, market-wide broadcasts on local network affiliates, or Over-The-Top (OTT) advertising. OTT is the latest advertising for internet TV and considered a new frontier for dentistry. RAMP’s custom television commercial production is fast, effective and economical. Our team will handle every aspect of your customized commercial, including script production, filming, and pre & post-production. Below are RAMP’s Television Commercial Samples. Radio uses words to create an image, or “theatre of the mind,” that directly connects to listeners. Neuropsychology has proven time and again that audio messages can, when created correctly, breakthrough the mind clutter and plant the emotional seed required to take action. 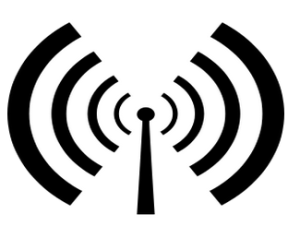 Radio is an ideal frequency medium that reaches your potential patients multiple times, and with consistent messaging to achieve top-of-mind awareness for your practice. With exclusive, time-tested, copyrighted content RAMP has successfully run more dental practice radio advertising than any other advertising agencies. You benefit from RAMP’s buying power and creative expertise. We know what works. Click on the image above to listen to our sample radio spot. Dominate the internet and beat out your competition with your web presence. Pay-per-click system (PPC) utilizes professionally designed ads to boost your website to the top of search engine results and targets patients actively looking for dentistry. RAMP PPC ads are automatically optimized to your web content and maximize copy relevance which leads to higher conversion rates and lower cost per click rates. Online Display Advertising, or online banner ads, are another form of pay-per-click advertising placed on other peoples’ websites where your targeted patients are most likely to visit. Patients can then click on the image and be taken directly to a page on your website for a specific procedure, such as implants. Retargeting, also known as remarketing, is a form of nontraditional online advertising that works by keeping track of people who have already visited your site, and subsequently, display procedurally targeted ads as they visit other non-dental websites. Preroll is a powerful visual tool that reaches your target patient by displaying an ad before the start of a selected video. If you’ve watched videos online, chances are you’ve seen Preroll advertisement. Typically, they are between 15 and 30 seconds long and have features that make them particularly cost-effective. Websites and Content – When it comes to online search engine ranking, the value of excellent web content is what will set your website apart from the competition. RAMP’s massive library of relevant dental copy has been proven, perfected and tested in real markets and on real dental consumers for over 17+ years. Let RAMP populated your website with the best content available to boost SEO rankings and gain traffic and leads. Click on the logos below to view samples of RAMPsites. Not all direct mail is the same. RAMP utilizes data, like Experian, to reach households that most accurately meet your target demographic in the most cost-effective way possible. 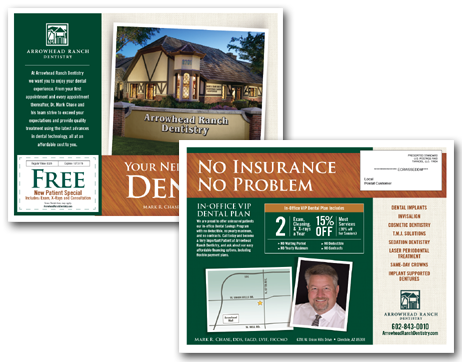 RAMP has various direct mail size options, but our most effective is a SUPER-SIZED (8.5 x 11″), double-sided full-color mailer. Sleek printing and design commands attention in the mailbox and comes at a fraction of the cost (44 ¢ each, delivered!) of similar direct mail programs. View RAMP’s Direct Mail Samples below. Outdoor Advertising, like billboards, are designed to catch a person’s attention in an instant with a memorable impression that lasts long after they have driven past. When done correctly, billboards can be very successful and difficult to ignore. RAMP’s team will find the best placement for your billboard and create a concise message that will resonate with potential patients for results. Print advertising offers the opportunity to target readers using physically printed media in magazines and newspapers or as free-standing inserts. Your RAMP media team will analyze what print medium will work best for your practice and develop a creative message that is representative of your brand and most attractive to your target patients. No matter the medium you are utilizing to get your message across, brand identity and consistent messaging are crucial. Branding helps to create awareness and a memorable image of your practice. Whether you are looking for a simple logo and appointment cards, a brochure, referral cards, or even a “jingle,” the creative team at RAMP is here to provide insightful solutions that will bring your brand to the next level. Copyright 2001 - 2018. All Rights Reserved. Site created and maintained by RAMP Sites.